Overall the story is still improving for buyers. Inventory in January was comparable to April or May of last year, a huge increase. Sales were down from a year ago, and foreclosures are still nearly non-existent. 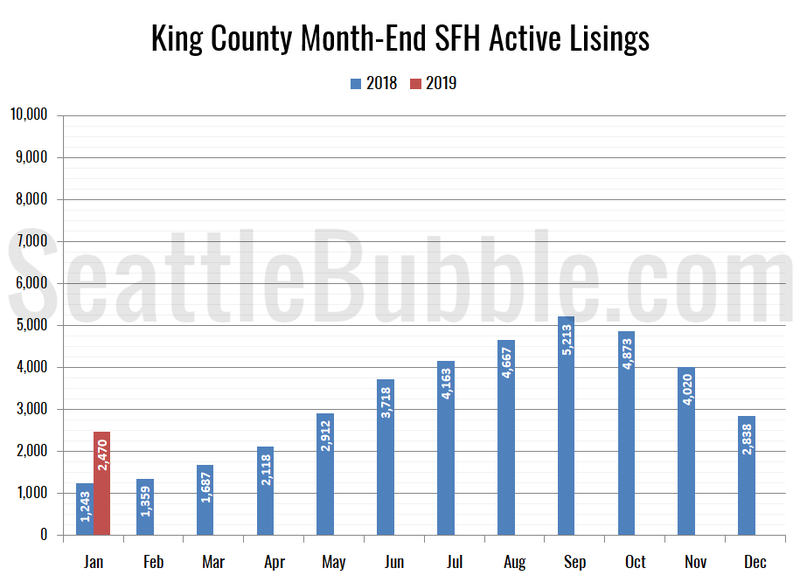 The number of homes on the market in King County dropped 13 percent from December to January, but year-over-year listings are still up quite a bit, gaining 99 percent from January 2018. In Snohomish County inventory fell 7 percent month-over-month, and the year-over-year growth was up 108 percent. 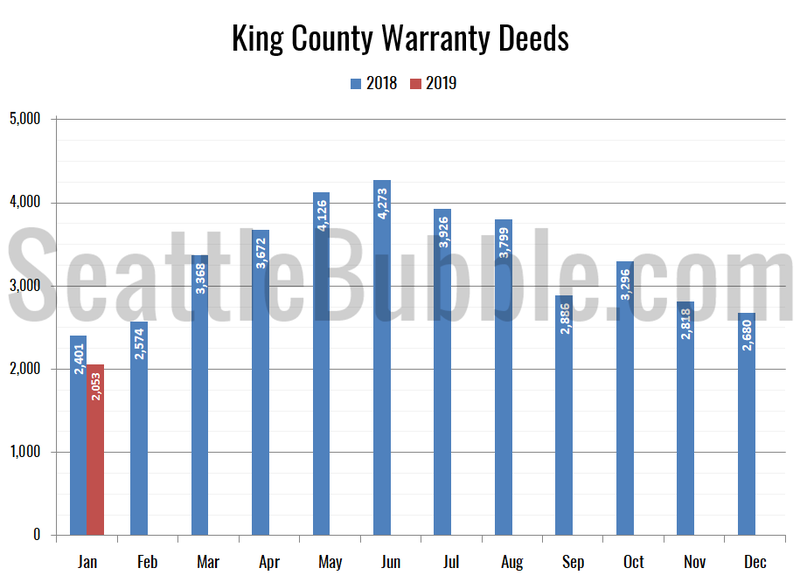 Sales in King County fell 23 percent between December and January (a year ago they fell 30 percent over the same period), and were down 14 percent year-over-year. 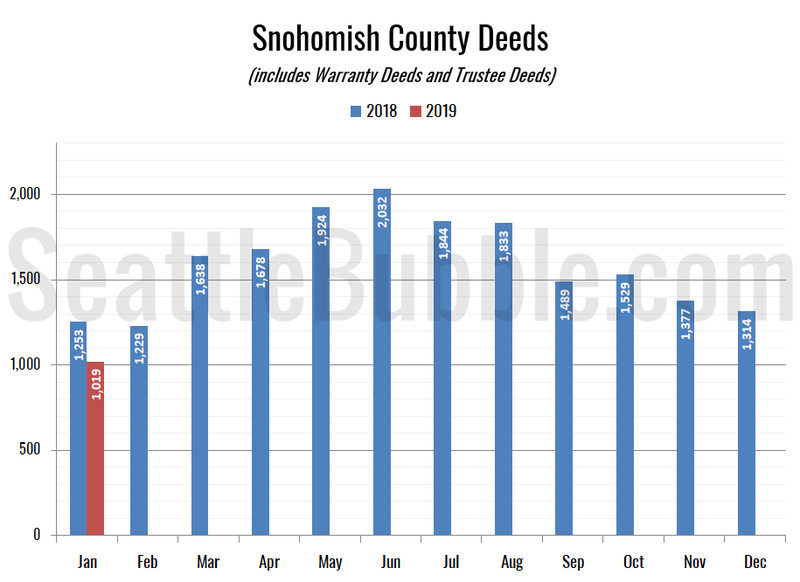 Deeds in Snohomish fell 22 percent month-over-month (the same drop as the same period last year) and were down 19 percent from a year earlier. 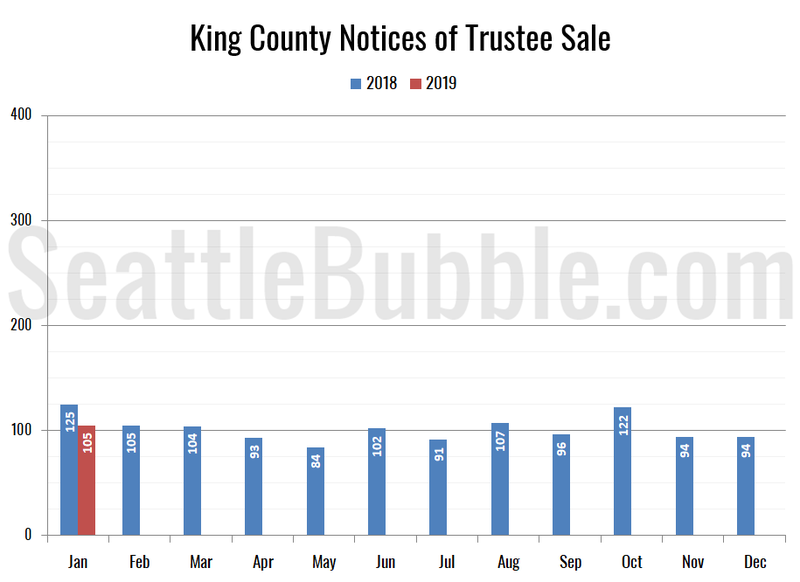 Foreclosure notices in King County were down 16 percent from a year ago and Snohomish County foreclosure notices were up 33 percent from last year. 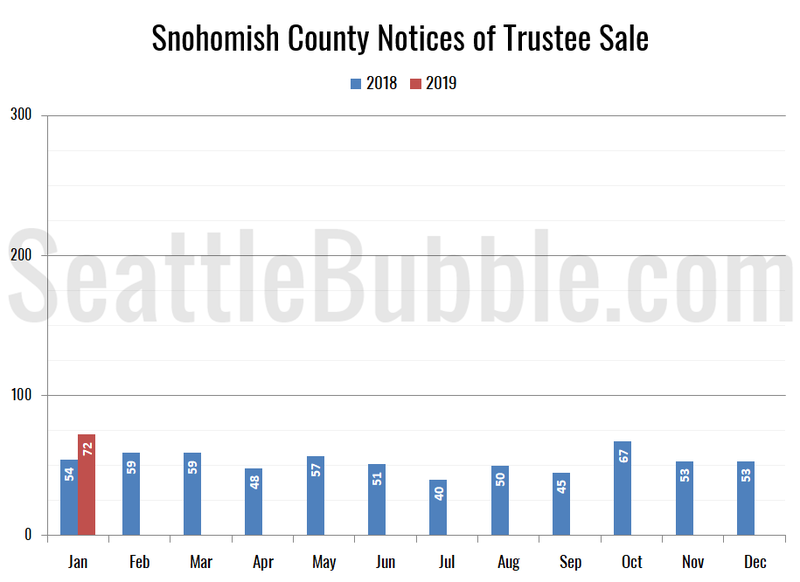 Since the numbers are so low, these increases appear large in percentage terms, but the increase represents just 18 additional foreclosures in Snohomish county compared to the prior year. 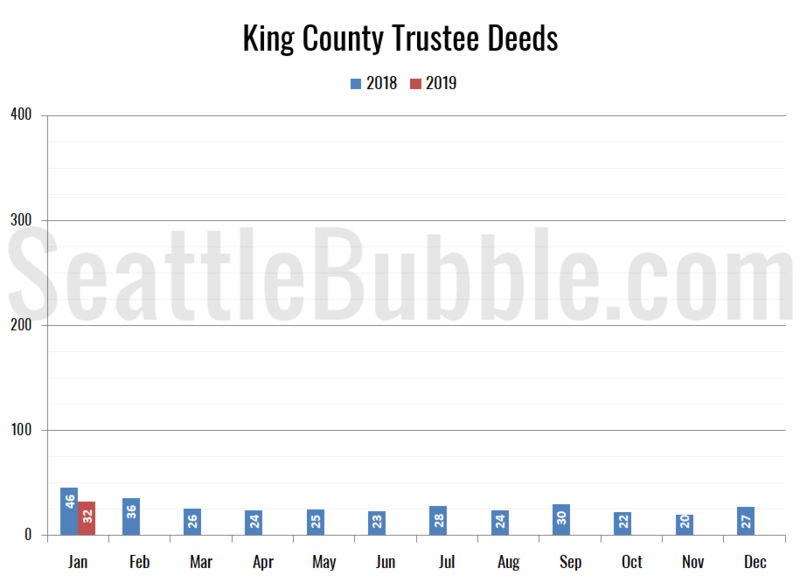 Trustee Deeds were down 30 percent from a year ago. FYI: Someone asked about the NWMLS stats for January. I’ve heard that they re-did their back end system, so I suspect that’s why their stats are taking longer than usual to release. Or maybe their data people are snowed in. Either way, I’ll keep checking and post here when their data for January is released. KC Median down to 610k. With storm coming this weekend, further reduction on open house traffic is expected. Maybe a sudden surge of listing will appear by Feb-16 weekend or even further delayed to Feb-23 weekend. The weather factor can put February another slow sale month. Good for buyers indeed. Rosenberg: (Median) prices have dropped a total of 16 percent in the last eight months. As mentioned above, KC Median down to 610k by Jan end. I think this likely means that Case-Shiller index will keep dropping, too. The NWMLS price release is out, and trying to instigate bidding wars. Don’t fall for it. Keep striking, buyers. 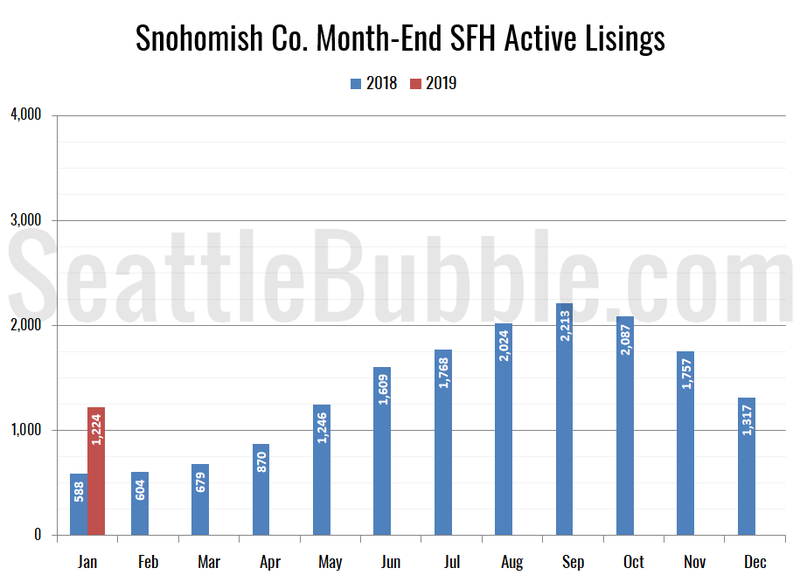 QUOTE: MLS members added 7,090 new listings of single family homes and condos during January, up from the year-ago figure of 6,805 and nearly doubling December’s total of 3,631. At month end there were 11,687 active listings in the database, up more than 45 percent from the year-ago total of 8,037. 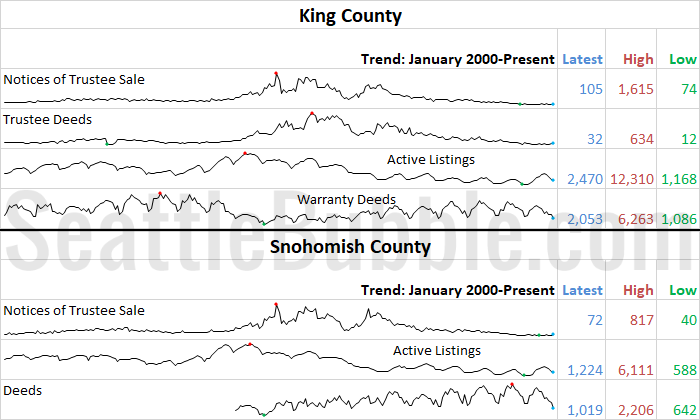 Listing inventory more than doubled in both King and Snohomish counties. COMMENT: But, but, but, ….. what happened with the “shortage”. You mean there wasn’t really any? QUOTE: “January started as a bit of a surprise. Open house activity was very robust, and we saw multiple offers in numerous instances again,” reported O’Leary, the owner of Berkshire Hathaway HomeServices Signature Properties in Seattle. COMMENT: Ooooh. “Numerous” instances of more than 1 offer. How numerous, dude? QUOTE: “The rise in inventory is largely due to investors who are selling because they believe the market has peaked and they want to unload their properties before interest rates rise too far,” said OB Jacobi, president of Windermere Real Estate. COMMENT: My, my. The so-called smart money is leaving? Say it ain’t so, Lennox! That looks like 5-6 weeks of inventory. Sounds relatively healthy – buyers should be able to find good properties and good properties should sell. I think people on this blog may find this interesting. QUOTE (Gardener report) : The slowdown in home sales was mainly a function of increasing listing activity, which was up 38.8% compared to the fourth quarter of 2017 (continuing a trend that started earlier in the year). 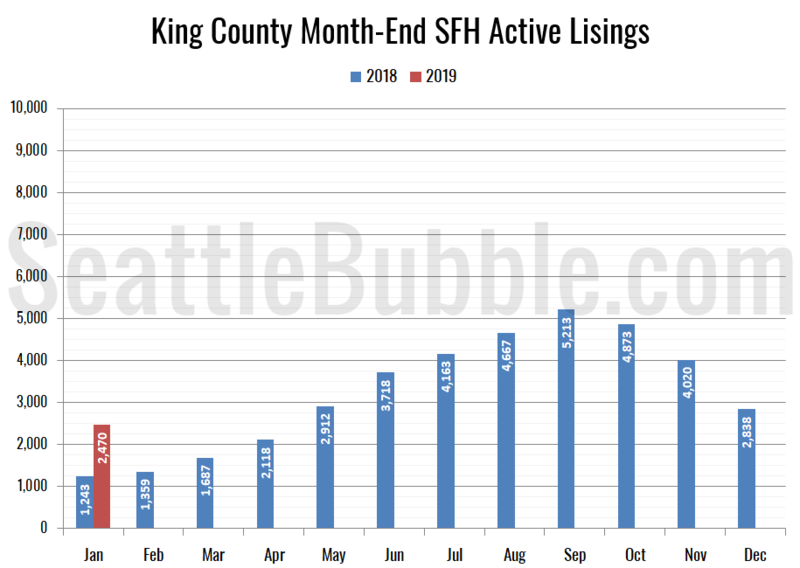 Almost all of the increases in listings were in King and Snohomish Counties. There were more modest increases in Pierce, Thurston, Kitsap, Skagit, and Island Counties. Listing activity was down across the balance of the region. More listings AND fewer purchases? That happens only under one condition, as long as the market is not saturated: The product is massively overpriced. Actually, I think it could happen under more than one condition. A lot of us come here to avoid being scammed by real estate agent nonsense. Real estate agents usually know the least about the market and where it’s going. Their job is to make transactions. You listen to agents on when to buy and sell and you’ll end up on the streets while they are on European vacations. You need to find a successful real estate investor and watch when they buy and sell. Listen to what they say. Sure its from the in-house economist of a brokerage, but its still interesting. This poor fat guy just trying to get through his day got completely scammed by this agent. This was released at the height of the last bubble. RE: uwp @ 2 – mr. rosenberg has published articles frustating home buyers for years. finally he come up with a different one. it is interesting to see how his assertion that price wont drop more than 20% hold as time goes by. there is another seattletimes real estate poster boy(with glasses,forget his name).how come nobody else like me blame these irresponsible self claimed experts? RE: Justme @ 7 – the reason for slow down sales is ridiculous. they have been saying that the inventory is still tight even with recent increase. i believe the main job of the real estate economist is to create excuse so their realtors can use on their clients or suckers. Purchased with a plan to rent it out. Couldn’t rent it out for $3,250/month. Couldn’t rent it out for $2,799/month. Finally rented it out for a year at $2,499/month. Realized renting this place out for $2,499/month is a horrible ROI. Now hoping to unload it on some sucker. 200k appreciation in 2.5 years is not too shabby, assuming it sells for the asking price. unfortunately I can’t find owner information. It will be crazy if this condo is for investment. Can’t believe buying such a small space with high HOA is a good investment. greedy and stupid. Not a good sign that 2 of top 3 job growth areas for 2018 are real estate related. I don’t know what the third, employment services, entails. @ Realistic #15 – I didn’t see the price they paid but yes, $200k is not bad at all. Of course, that is gross, deduct the $75k in closing costs + the cost of financing + x number of vacant months + tax on profit + dep recapture tax. RE: N @ 18 – And it won’t sell for what they’re asking. I know that building and they haven’t been selling for what they’re asking. $829k for a 1k/sf condo? That is INSANE. You have zero yard. Disconnected from the Earth. High intensity dog urine outside the building entry. Why not take the new Burien expressway (aka tunnel) and buy a house there? It offloads you almost at Amazon. There’s a bubble forming in the Scottsdale area now as well. Being from Seattle and bailing to Eastern WA, I took my money and ran. We wintering in Scottsdale area now, and things have gone way up here, but now the word on the street is the market has almost totally stalled. Things are staying on the market and one realator remarked to me that she simply thinks the entire market is now full of overpriced wishful thinkers. There is tremendous value in some downtown condo buildings within mere blocks of hundreds of jobs and amenities. People who are hung up on, and only familiar with SFH often fail to see this. I’ve had great results in only these type of buildings. My next one I reserved in 2016, will close in late 2019. To each their own I guess. Careful on the ice, everyone! What is your exit strategy? So you reserve the condo and then wait for the condo to close. What do you do with the condo after it closes? I imagine you either rent it out or sell it, so which one? it depends on the expected net cap rate including mortgage payments and his anticipation of the market. honestly, it’s probably hard to get even 3% after the hoa and prop tax for new downtown condos (assuming the condo is paid for; 450k (low floor 1br or studio introductory rate for new condos back then) will net you 2500 if you are lucky – 1000 per month for hoa and prop tax and you get 1500 on a 450k-500k unit)) unless you got an insider deal or staked out in front of the building overnight and got one of lower floors where price vs sqft is more reasonable. obviously, the math gets worse for more expensive 1br units cuzz rent doesn’t keep up with the price most of the times. in terms of selling, he’ll have to see what the market is at that point but it’s i’m guessing by then you’ll be lucky to break even after commissions and fees involved because this is also the market that will be most heavily hit by the apartment conversion to condos. i anticipate it’s gonna sell for 730-750k. mediocre height and mediocre view. i think it’s priced wrong. that price is last year summer/fall price. also, as you can see even taking price into 700k, with 2500 in rent, the cap rate with just hoa and tax will be 1300. with net 1200 or 14400/700K, that’s barely 2%. These people that purchase Seattle condos and rent them out are crazy. They are trying to make a profit when there is no profit to be made with condos. Like you said, cap rate is too low. King County median is falling at near the maximal steepness seen in the 2008 bubble bust. That means the 2018 bust is pretty much offical. Or should I say, if this is not a bust, it will do until the real bust gets here. RE: Justme @ 31 – I think I catch your drift here. Only 4 more years until it’s safe for you to buy. But don’t be a slave to the calendar. Other things you can do then are wait for the next leg down, or wait for the excessive crowds to thin. After all, you don’t need to hit the exact bottom. But I apologize in advance…I’d have to see the whole cost model to believe it…in writing. Assuming you lucked out being a landlord paying HOA fees, maintenance and MASSIVE 2019 PROPERTY TAXES….I tip my hat to you. I’m a savvy investor and have no idea how the general market of Seattle area Condos [$650/mo in HOA fees alone in lowly Renton, Seattle has to be 2-3 times that bad] survives on life support. My friend Jack had a rental cottage in Covington he closed down 15 years ago because he lost his shirt doing it [mostly evictions, unit destruction, drug labs and delinquent rent]…he’s wealthier now shutting it down for 15 years [and the unit can’t be legally rented out after its a “drug lab”, its toxic]. My example is single case, but so is your’s. Are you feeling any guilt or contriteness or shame for goading people into buying when they should not have? Any sense of guilt for being a bubble-monger? RE: Justme @ 34 – Read my posts. I don’t goad any people into buying. I do sometimes call out the ridiculous. Then there’s the analysis “body” of the speech [as Toastmasters calls it] that can be based on “Urban Legend” Mother Goose Fairy Tales”…without raw data collectively [in writing] supporting a single case or opinion. I love Toastmasters, its my laboratory to spill chemicals all over and learn from my mistakes, instead of going into denial. I do hope I’m becoming less of a “pig headed” Baby Boomer than I was….learning is life long and continuous and changing your opinion is professional duty, not an option. I have read a few comments from individuals that are hoping to buy a house in the future, but are not doing so at this time because of various factors. What is primary factor or factors in dissuading one from not buying a personal residence at this time? increase in real estate prices ? If prices start to increase, what percentage increase would encourage them to re-enter the market, if at all at this time? Decrease in mortgage rates? If so – how much lower before one decides to actively re-enter the market if at all? Other factors – such as marriage and the arrival of children? I look forward responses to learn what those who are contemplating buying a personal residence in the future are thinking, what factors are driving their decision, and the primary factors that would get them actively re-enter the market at this time. RE: ess @ 38 – Early 30s, trying to skip the “starter home” phase so sitting on the sidelines until I have more saved up and know where I want to be longer term. Also want to see a better inventory of quality product – it seems most everything sub $1MM is cheap renovation or doesn’t have the bones/ lot to justify a major renovation. Looks like inventory is starting to grow in Seattle but suburbs like Bainbridge Island have yet to feel the same softness. Currently a renter by choice with no pressure to buy so will keep waiting to see where things shake out. RE: ess @ 38 – bigger square footage, better living condition of SFH, good school, and most important of all: not too expensive, loan amount ~ 3-3.5 times household income . for example, if the household income of seattle is 150K, for a SFH (>=2000 sqft, >=3b2b), the house price is no more than(150K*3.5/80%,assume 20% down) $656K, which is still very expensive. @ Erik 24 – Great job trolling, haha. And the newbies have no idea that you have been the loudest and biggest proponent of buying and renting condos, even at negative cash flow. no it’s not it’s simple math. if the appreciation is 30-40% and you pay about 8%% in fees/commissions and taxes for sale, ur still left with 22-32 percent profit. rent isn’t great but it obviously pays off the hoa and taxes how ever high. of course, this is with model in which there were no mortages but if you take into mortgages, you can minus some percentages for the interest paid. Dear Sucker Homebuyer, which emotional hot-buttons should I concentrate on pushing in order to make you buy an outrageously overpriced Taj Mosspit? Signed, Bubble-Monger, unapologetically trying to make as much profit as possible at the direct expense of Renters and Savers. @ESS – Great question. Hopefully your question leads to insightful responses. Now that prices are down over 16% from peak it’s a good time to consider. Honestly for my family cash flow is the biggest consideration with long term investment potential coming in second. Right now, to own the house we rent we would be looking at a monthly payment about 36% higher. Sure, some of the forced savings help a bit in the long run but still. We’d be willing to stretch to about 20% above our current rental payment. Our family could use a little more space but not willing to take on longer commute times and less time with our kids to get it. Also, not sacrificing retirement contributions and other things just to be cash poor in a house. We have owned most of our adult life before moving back to Seattle 3 years ago and still have a rental property somewhere else we are paying down on a 15yr term so owning long term is our preference but not the only goal. Bottom line – in the past 12 months the rental vs buying numbers have slanted completely toward renting to us. Things are starting to get interesting, and with another 5-10% drop we likely would get serious. It’s interesting that I don’t think that I would fall into any of your categories you listed for reasons to not buy now. I would like to buy, but it doesn’t seem like a good idea right now because of how little I would get for my money. I could technically afford it, but that’s different from being willing to pay these astronomical prices. I am currently renting a nice house in a nice neighborhood with great schools. If I were to buy the home I’m renting (which needs a lot of updates), I would be paying $2,700 more a month than my current rent. If I bought a less expensive home (of which there are few) I would be really compromising on location, home size, how nice the home is and it would be a significant downgrade from my rental and would likely still cost more per month than my rental, even with 20% down. Looking at home prices in my area, I likely could have found a house I would have been happy with at a price that didn’t seem completely ridiculous up until 2016. Ever since then, prices have seemed, well, bubble-esque. I am still watching the market closely and if I find something that is the right fit at a more bearable price I will likely buy it. But I think prices need to come down more before that’s likely to happen. If I were to buy a house I really wanted right now it would be a stretch, even with a big down payment, and that just doesn’t seem like a smart decision as prices continue to fall. So I will keep waiting. I’m not looking for an investment. I’m looking for a home. But if I’m going to be there for 20+ years I want to love it. Yes, I agree with everything you just wrote, Rentin. We’re in the same boat as buyers. We’ll buy when we find something we’ll be happy with, and stay there 20+ yrs. I’ve been lurking for 2 years, and thought I’d respond to this post with my personal situation. I’m married, no kids. My wife and I both work, and have good income. We have plenty of cash for a down payment, but in the areas that we’d like to live (Bellevue, Kirkland, Issaquah), anything we’d like to stay in long term is either really terrible or ridiculously expensive. We currently just signed a long lease in a new apartment complex, and though the rent is not cheap, we absolutely love living here, and are in no rush to overpay for a house. I work in tech, and I have many coworkers who have high salaries, and are not even considering buying a house unless there is a ~20% correction or so. In the meantime we are all renting and saving as much cash as we can. We constantly wonder about who is buying 1M+ houses if dual income folks like us are not even considering it in this market. I know a lot of the run up has been due to Amazon and Chinese buyers, but how long is that truly sustainable? I try to follow everybody’s comments and thoughts here but ultimately have no clue what’s going to happen in the future. In the meantime, I’ll rent for a few more years and see how things play out. If the market doesn’t correct, we’re than happy to continue renting indefinitely. I have an Ally savings account (Capital One Spark for business) both paying 2.2%. Amazon is reconsidering their NYC HQ. Maybe KC can get smart enough to recruit them somewhere South of Seattle? On a side note: Amazon Alexa is about to be joined by the Amazon Pecker. Bezos should give up his fling and go back to his wife before he totally ruins his personal life. exactly my point. if bank earns u just as much eithout the headache of mainimtaining buying and selling with depreciation recapture later on? why would anyone invest? if u buy a property anticipating price appreciation which is a bit hard right now, that would be specuvesting. with the prices and price trend right now downtown cannot be a sober investment. once people stop investing, there will be worsening downturn with less demand imho. once that happens the fall would spread to more distant regions like an earthquake. ppl think condos and sfh are completely different markets but theyre not. lots of ppl can be very flexible when it comes to money, especially when its a lot of money. also, as u can tell mortgage vs rent just doesnt make at this point due to price and interest. unless ppl are in fear of being priced out of a home people rnt going to buy especially if they think they can get more for their money in a year or two. just like the ad, why pay more? Thanks N. I wanted to hear what people that don’t know about condo investing thought about condo investing. Sometimes I think about buying other assets and then I think about how easy and lucrative condo investing is and I go back to condos. Condos in the city will always rent. Then you can keep them as long as you want to as long as you can deal with the negative cashflow and sell for a big profit. We sound like minded. In the beginning, I just bought condos and then sold them in 2 years. I still do that. In fact I’m doing that right now. Then I got a nice profit on one and bought more condos which all have a good amount of equity. I buy at the auction and remodel them so I start with equity. I plan to repeat the process of buying and selling until I can pay off enough condos so I can quit working. Funny watching everyone still post here with a new entry up. I’ve never bought at the auction, I’d like to look into that. I always make improvements by myself to the condos as well. Maybe it comes from growing up poor. As soon as I saw that I could put 150k in my pocket back in 2007, I sold. I didn’t even really have a plan at that point. All I knew is It would have taken me many years to save up that kind of money. I’ve done the same thing 3 more times. I’ve never been greedy, I just appreciate a hefty savings account to relieve stress. I’m at the point now where I’m content if the market goes up or down. Either way, I’ll make it work for me. Be well Erik. Even more pointedly is the Case Schiller report that housing historically returns 0%. Hence, KC raises property tax by 43%. That was my same goal when I started, I just wanted more money in my savings because I got tired of being broke. Not like I have a bunch of money now, but I have a little more than I would have without investing. I like the idea of buying multiple condos and then selling some of the condos to pay off the mortgages on other condos. It just seems like the easiest way I can think of to create passive income. Do that enough times and you can get enough passive income to where you don’t have to buy and sell anymore. RE: ess @ 38 – I work in tech, and I have many coworkers who have high salaries, and are not even considering buying a house unless there is a ~20% correction or so. In the meantime we are all renting and saving as much cash as we can. We constantly wonder about who is buying 1M+ houses if dual income folks like us are not even considering it in this market. Unfortunately, there are a lot of people who can afford $1M houses, and I’m one of them. Of course, I could NEVER afford it if I were in your position… paying that much cash that would be crazy. But my crappy $500k house purchased in 2013 is now worth $800k-$900k, and (with 5 years’ career growth under my belt) it wouldn’t be a huge stretch to trade up to $1M. Feels weird to say that but… here we are. RE: Drone @ 58 – On the topic of sustaining current prices, to maintain the current market prices you need new buyers coming in, first time buyers who can/will pay these prices. In order for you to sell, someone would have to buy your self-described “crappy” house for the $800K-$900K. It isn’t exactly a Ponzi Scheme, but it definitely has Ponzi characteristics. That’s why prices are down 16% in the last 8 months. It wasn’t/isn’t sustainable. Current owners shuffling properties amongst each other will not sustain it. Thanks N. I wanted to hear what people that don’t know about condo investing thought about condo investing. You’re assuming that these people posting don’t know about condo investing. And that you understand the financial concepts better than them. As you’ve said yourself, your track record is not so good. A little humility wouldn’t be such a bad thing. Okay. I screwed up on the first property I bought, which was a house. I bought my first condo November 2011 and have been buying condos in a market that just goes up. I’m not saying I have a special skill, but I have been successful with condos in Seattle. Could just be the market. Better to be lucky than good I guess. Noted, commenters on this site like to hear about my failures and not my successes. I think it’s because it makes them feel better about themselves. If it makes you feel better, I have a very long list of failures from relationships, to jobs, to investments. I try to share what worked for me so others can repeat the same process. If you want I can talk more about my failures so you can feel better about yourself. I bought my first condo because my fiancé dumped me and I used the money for the ring to buy a condo. I was forced to short sell my house in Everett because I couldn’t afford the payments. 2 years later, I was laid off from my job. I use to have a weight problem. I was unhappy for a longtime and drank alcohol a lot. Like I said, I could tell you about all my failures. Condo investing has been one positive thing in my life when I was down. RE: Erik @ 61 – Thank you. That post was real, and not one sided biased bubble-blowing propaganda. I just wanted to point out that the key to your condo landlord strategy is a highly appreciating market. In a flat (or within a few % of flat) market, I don’t believe one will make any money doing this. After selling the condo you may walk away with some money, but that’s just because you’ve paid down the mortage. But that has come from your savings each month (covering the negative cashflow). So you’ve basically paid out of pocket from savings over the years, and then you get that back when you sell. Moving money from one pocket to the other. So it’s really gambling/hoping that there is a highly appreciating condo market. Noted, commenters on this site like to hear about my failures and not my successes. I think it’s because it makes them feel better about themselves. To be honest, it’s just when you start getting cocky or arrogant. I don’t think the vast majority of commentors wish you any ill will (I know I don’t). It’s just human nature that when someone gets arrogant, others want to bring them back down to earth. I learned the most from people on here that were “bragging” on this site. Others bashed them and I ask follow up questions like I did on the last thread with the person buying condos before they are actually built. There could be some upside there it sounded like. I may try it out at some point. Corndogs and Ray Pepper taught me a lot and they were beat up and called braggers. Ray is really good at the nuts and bolts and how to navigate the real estate world. He’s on the cutting edge and is a generous and great resource. He truly wants to help people. Corndogs looks at historical data to predict the future which is very powerful. He showed me how smart money thinks. Both commentators talk about what works and I wish more people did that but they are afraid to because people that talk about their successes get beatdown on here. I wish people would stop beating down others that share success stories so I could learn more. RE: Erik @ 64 – OK. I would just like to caution readers that to be successful, any of these RE investment strategies require a market that is appreciating at a fairly high rate. They’ve seemed great these last few years, but that’s just because of the price boom that occurred during that time. Those boom times are the exception, not the norm. It’s best to diversify your wealth, and not put too many eggs in one basket. For about 95% of people, their primary residence is more than enough real estate as a % of their net worth. Historically, the stock market has returned well over twice as much as real estate. Ray made a ton of money in the last bust and became wealthy during that time. I listened to him in the down market and prospered greatly during that time and got out of poverty. The people jealous of him just insulted him and suffered. There is a counter example. RE: Erik @ 66 – I’m curious how one makes a ton of money investing in real estate when the market is flat or going down. Seattle is temporarily in a flat market. Shortly Iater, it will go up or down. In an up market, buy and hold until you want to sell. I try to get 2X the purchase price and then sell to make it worth it. In a down market, go buy at the county auction for cheap and sell them for more. When the market goes down, there is an oversupply of foreclosures. Take advantage of that oversupply and get one for half price. Fix it and sell it. RE: Erik @ 68 – So it does require an up market (a significant one to make any real money), or buying for dirt cheap (you mention half price). Buying for half price indicates that nobody else at the auction realizes the value of the property, and therefore you are able to buy it for half of what it is really worth. Not sure why the others at the auction wouldn’t also bid on it and buy it. And yes one can buy a place and fix it up, but that takes the effort you put into it, which is basically like getting a second job. So it’s really just like getting a second job, not really “investing”. This is why real estate investing is no better than any other type of investing. One could strongly argue stock market investing is better. Okay, you should invest in stocks then. Speaking of stocks. Putting a reservation deposit on a downtown high rise is a lot like options trading. With a 5% reservation fee you are essentially buying an option to close on the condo in 2 to 3 years when the building is completed. 1)If the market has appreciated, obviously you’re happy. 2)If the market is flat, it’s still equivalent to having a renter helping you break even for 2 to 3 years. 3) if market goes down, sellers will often allow you to renegotiate to keep you from walking away, or you can get a lawyer (for a fee) to find an “out” in the contract to get your 5% back. That’s a great way to look at it. The great thing about your strategy is if you invest $50k, the principal of your investment is $1M. If the market goes up 20%, you’ve made $200k minus selling costs just for putting money down. And I really like #3, finding a loophole out of an investment that goes bad. If all else fails, live there or rent it out. Thank you for sharing, I need to try this. RE: The Tim @ 1 – The Tim: what happened to your nice Case-Shiller graphs for the last 2 months?! I look forward to this data near the end of each month and have been reading your site since 2006 or so (I only look at the C-S stuff now, as most of the commenters are real-estate agents or Socialists, and I have nothing in common with either contingent). I’ll look for a reply or wait at least until the end of this month. I tried to find out if you posted somewhere that you are done doing the C-S graphs but found nothing. BTW, I do know the data is elsewhere, but your tableau graphs are THE BEST, THE TIM. Why do you think invest Condo is better than SFH? Condo has association fees and tough rules for rental. Seattle cap ratio is so poor now. Unless you want to live in yourself and hold it for many years. I view condos as a less risky investment. If you wanted to sum up everything, it’s all about risk management for me.